Printed copies of the booklet are no longer available on-campus, but if you are interested in such an order (>100 copies), please email LEChris@Illinois.edu to discuss a special print run at cost. Across the Mississippi River Basin, 45% reductions in nitrogen and phosphorus loads are necessary to meet national goals established to reduce the size of the Gulf of Mexico hypoxic zone. There are a number of practices now being promoted as a part of state nutrient strategies, all of which have different N-reduction effectiveness, spatial suitability, additional benefits and impacts, and cost. No one practice will be suitable for every acre, but every acre needs at least one new practice. A newly funded North Central Region Water Network Seed Grant project, led by the University of Illinois, is underway to develop a comprehensive package of information about these drainage water quality-improvement practices. This effort is leading off with the release of a booklet entitled “Ten Ways to Reduce Nitrogen Loads from Drained Cropland in the Midwest,” and will include presentations for educators, online modules for additional audiences, and a Ten Ways summary factsheet. Click the link above to download an electronic copy of the booklet. The Ten Ways strategies include in-field cropping and management strategies (i.e., practices that reduce nitrate in the root zone), in-field strategies that modify the drainage system (i.e., practices that reduce delivery of nitrate to the field’s edge), and edge-of-field strategies (i.e., practices that remove nitrate at the edge of the field or downstream). Please click here to complete a Google Form requesting access to the PowerPoint presentation modules that accompany the Ten Ways booklet. We’ll also provide a survey for your program to help us track understanding of the the Ten Ways and to evaluate the impact of this project. Christianson, L.E., J. Frankenberger, C. Hay, M.J. Helmers, and G. Sands, 2016. 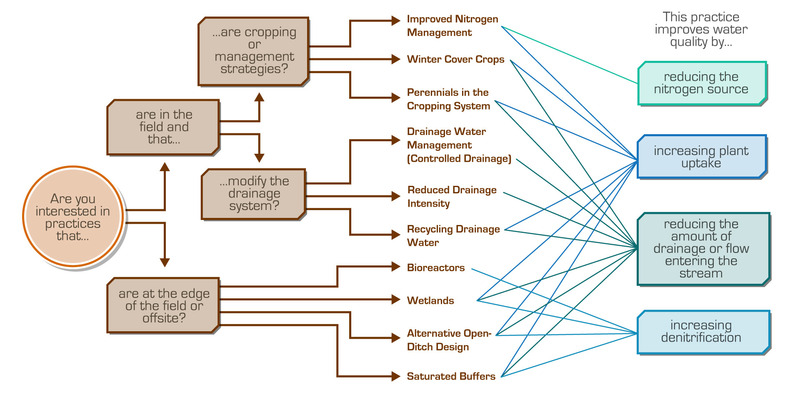 Ten Ways to Reduce Nitrogen Loads from Drained Cropland in the Midwest. Pub. C1400, University of Illinois Extension. Thank you to the North Central Region Water Network for funding. The Illinois Drainage Research and Outreach Program (I-DROP) at the University of Illinois is all about practical solutions to improve agricultural water quality.